We have a group of eminent academicians belonging to various universities of Delhi who advise us on diverse needs of the Library. 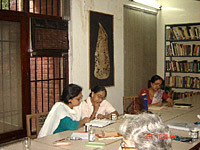 Some of Manana’s friends form the core advisory group of various activities that are held at Manana. It would be difficult to mention all their names but we would like to express our appreciation to one and all. Dayakrishna, P. S. Diwedi, Mushirul Hasan, Mohini Mullick, A. Rahman, Tan Chung, Dr. Narayani Gupta and Drs. 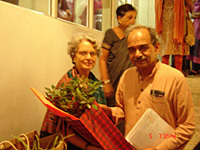 D. N. & Lalita Panigrahi, Susheela Ambike, Asha Deodhar, Meenakshi Gopinath, R. Guha, Umesh Jha, Sneh Mahajan, Renu Maira, Amiya Sen, Vijaya Ramaswamy, Nirmalaya Samant, Anil Sethi, Upinder Singh, and Nayanjot Lahiri. We fondly remember Professor Ramachandra Gandhi as an extremely valued friend & mentor, and as the person who gave us the name Manana. Dr. Neeru Kanwar, career counsellor, psychological and emotional guide offers her guidance to Manana’s youth. Dr. H. K. Kaul, Director DELNET, was the guiding hand in setting up the Library. He advised us on its computerisation and cataloguing systems. Professor Mohini Mullick has advised and guided us, and is an active participant in all Manana’s endeavors. editing skills and research facilities. He continues to take an active interest in the Library’s daily affairs. Dr. Anil Sethi is instrumental in bringing in and keeping the young members of Manana active and enthusiastic. His practical suggestions, academic and interpersonal skills are responsible for making the study circle, a continuous activity of Manana.